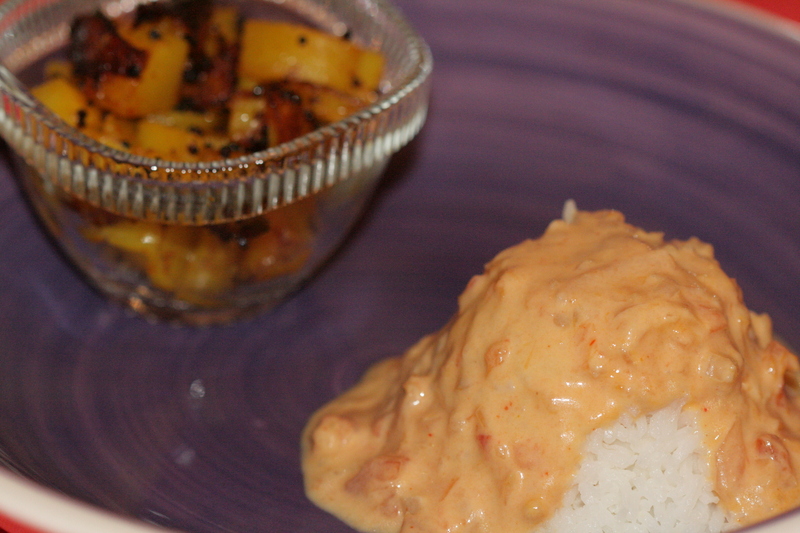 Tomato Sheer with steaming hot rice and fried prawns! PP comfort food, irrespective of the weather. The vegetarian version, detailed here, is great but sometimes baby shrimps are added into the curry, taking it to a whole new level. Simple and quick to make – it is delicious with rice but hot phulkas go well with it too. Add a side dish of potatoes and fish or prawns and you have an amazing comfort meal ready. In a pan, heat the oil; add a pinch of asafoetida and the fenugreek seeds. Add in the chopped onion and sauté until transparent. Add the chopped tomatoes and cook till the onion and tomatoes combine to form a thick paste. In the meanwhile, dissolve the besan in a few tablespoons of coconut milk. Add in the salt, paprika powder and sugar and mix well. Combine with the rest of the coconut milk and make sure that you have a homogeneous mixture. Add this coconut milk mix to the pan with onion and tomato paste. Whisk to combine it together. 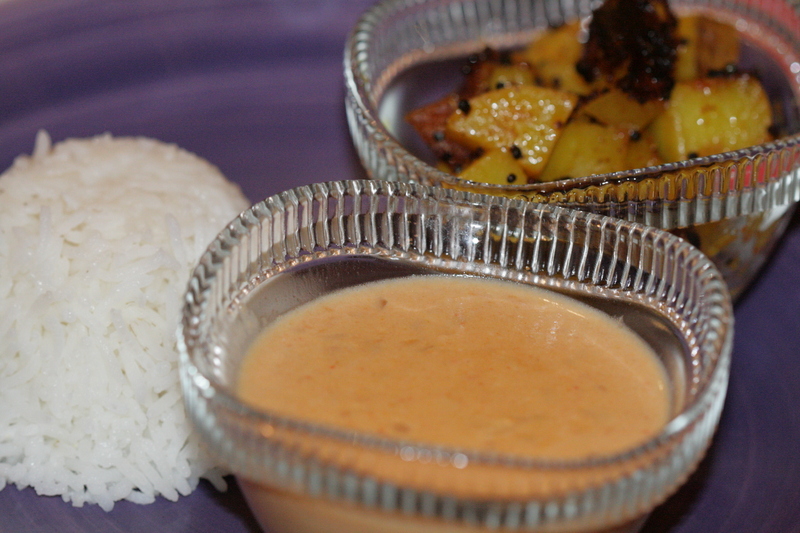 Simmer on a low heat to ensure it is cooked, consistent and that the coconut milk does not split. When it comes to a boil, taste to check for salt and sugar balance. The sugar is only intended to take the edge off the acidity of the tomatoes and should not overpower the taste of this curry. 1. Since this is a mild curry it goes best with spicy side dishes such as Kurkureet batate or a garam masala mutton, fried prawns, spicy fried fish etc. 2. As mentioned in the introduction, you could even add baby shrimps (better known to the PP community as ‘karandi’) to this curry. This entry was posted in Curries (Kaalvan, varan, sambhare etc.) and tagged coconut milk, shrimp, tomato and coconut milk curry, tomato curry, tomato sheer, tomatoes. Bookmark the permalink. Hi… I was planning to start blogging PP recipes when I stumbled upon your blog. It’s so wonderfully refreshing to see someone documenting our age old recipes… I moderate a Facebook Community called ‘Pathare Prabhu’ foodies, where we’ve recently started doing posts with pictures of our food. Would be great to have you too in the community… Coincidentally, I cooked tomatoche sheer with prawns for lunch just yesterday and posted some pics in the community… Do check it out. Unfortunately couldn’t figure out your name / details on this blog. Thanks for the invite to the Pathare Prabhu foodies community. I will send you a request to add me. Tomatochi sheer is my absolute and all time favourite along with hirve kaalvan. Look forward to being part of the PP foodie community (I’m already on the other FB – PP community.) And yes, comments and feedback on the blog are always welcome.